The Platewriter 8000, produced by Danish pre-press manufacturer Glunz & Jensen, uses inkjet technology to convert computer-generated page layouts to plates ready for printing in a single step. The state-of-the-art unit eliminates several steps in the pre-press production process that involved developing film negatives of each newspaper page, splicing them together, then using a chemical process to burn the images onto plates, said publisher Jane Seagrave. Using the Platewriter, the newspaper can transmit image files by computer directly onto plates that are ready to put on the printing press. The Platewriter was purchased from Hank Clifford of RMM Associates, a Massachusetts-based dealer that represents Glunz & Jensen products in the United States. Mr. Clifford and Steve Swihart, North American sales manager for Glunz & Jensen, were on-Island this week to install the unit, the size of a compact car, in the Gazette’s Edgartown office. The unit occupies a former darkroom adjacent to the newspaper’s Goss Community Press, which was installed in 1974. 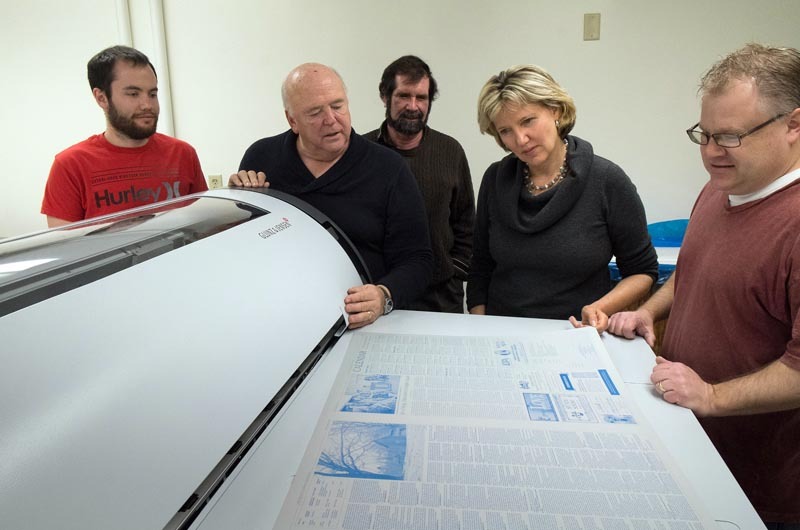 The Gazette is committed to printing the newspaper on-Island as it has for the past 169 years, Ms. Seagrave said. The addition of the new Platewriter unit resolves the one weak link in the production process, said press supervisor Jeremy Smith. Mr. Swihart said about 1,600 Platewriters have been sold globally, mostly to commercial printing operations. The units are relatively new to the U.S. newspaper market, with about 30 papers now using them. “It’s a good fit for geographically challenged areas like the Vineyard because it is easy to use, requires little maintenance and it has a great environmental footprint,” Mr. Clifford said. He noted that the steps saved by going directly to plates also results in better quality images. “Your photographs are going to be much sharper with more contrast,” he said. 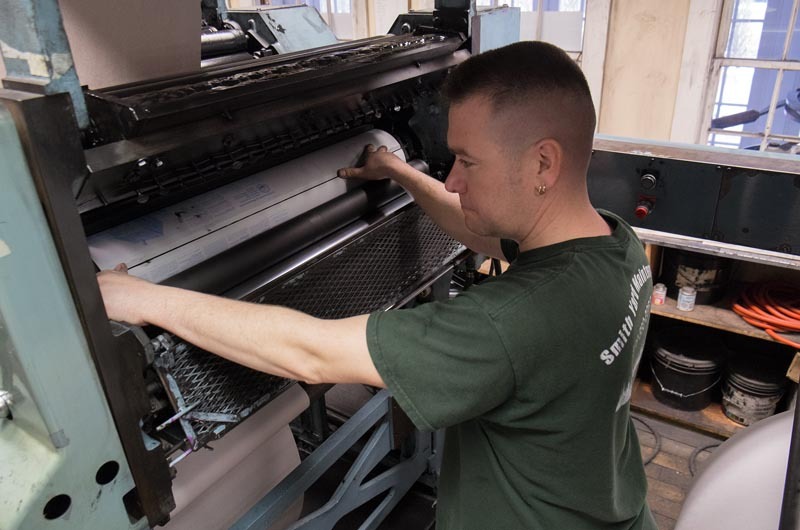 The March 27 issue of the newspaper is the first to be printed with the new technology. View photos of the new platemaker installation. I'm curious, having studied and worked in the printing industry for several years. Is this still an aluminum plate or is it a type of paper plate? I remember stripping the negative and images and then burning them onto a aluminum plate, which then had to be developed and fixed. When I moved into a different job, this location had a machine that would copy paper text onto a paper plate, load it onto the drum and start printing. It had a limited run. So, I'm curious about this new technology. If I am visiting on vineyard, would it be possible to visit the newspaper? Thanks! It's an aluminium plate. Instead of using the various chemical treatments to develop/fix the plate, an inkjet printer is used to print directly onto the aluminium. The plate is then dried, and then ready to use. The time taken depends on the size of the plate, and how much you spend to get a faster printer, but from pushing the print button, you can produce a plate, ready to go on press in less than 10 minutes without using any chemicals. Will those sharper photos be in color? Does this mean no more smudgy fingers when I read the Gazette? It is printed the same way, so the ink will still be on the fingers, but the way the medium is transferred from a computer digital image to an aluminum plate, is what has changed. The aluminum plates are then covered in ink and act as a template for what is printed. They have eliminated a step in the process which saves on everything. GOOD WORK!